Comedian Billy Cox serves up drinks during his day job. 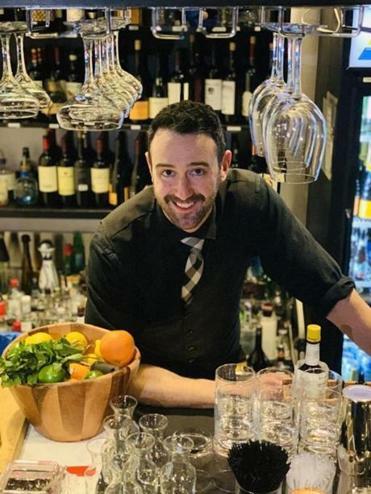 By day, Dorchester’s Billy Cox is a bartender at the Seaport’s Ocean Prime. By night, he’s a comedian with Improv Asylum. Sometimes he bartends until around midnight, then zips over to do a late-night show. Don’t expect a private performance if you visit him at work, though: He doesn’t practice his routine on restaurant guests. “I don’t torture anyone! That’s a form of terrorism,” he says. I grew up in Quincy. My earliest memory of eating in a restaurant is at a place called Walsh’s. It’s not there anymore. I must have been 5 or 6. I remember it because my father had me ask the server for a “brownie a la mode with ice cream on top.” He got the biggest kick out of it. Everyone laughed. I was the youngest one at the table. What’s one thing you’d like to fix about the restaurant industry here? I wish there were more options for a full-on, late-night meal. I might be crucified by fellow service industry people for later shifts, but you can barely catch a train after 12:30, let alone get a meal, and I work almost every night of the week. What other restaurants do you visit? Late-night spots. I go to Moonshine 152, and it’s perfect — I get Mama Mei’s dirty fried rice. She has the best fried chicken wings in the city, and amazing brunch. I just had an amazing dinner at Sarma. It was my first time there, and it blew me away. I like the South Street Diner. And can I give a shout-out to Biddy Early’s? If I’m more thirsty than hungry, Biddy Early’s is the spot. What’s your earliest food memory that made you think, ‘I want to work in restaurants?’ I was rolling quarters to take a girl to the Cheesecake Factory, and I knew I needed a job, so I got a job as a doorman. Then I was a bar back, hauling beers up the stairs. And I remember my first shift bartending — the conversation you have at the bar! It led me in. It made me realize that I was going to seriously pursue this. I worked at Mr. Dooley’s for almost a decade. What’s the worst restaurant experience you’ve ever had? I was at a casino steakhouse at Foxwoods, and I don’t know if the crew was running back and forth between blackjack tables and serving us and cooking food. Three of us got the same steak, same temperature, and every steak came out differently. My steak was butterflied. You can’t even make that mistake! It looked like they butterflied it with a chainsaw. The management was nowhere in sight. How could Boston become a better food city? Again, I will say later kitchens. If you work nights . . . you miss out on a lot of food that Boston has to offer. I eat a lot of supermarket sushi. Name three adjectives for Boston diners. Particular, loyal, generous. And I think if you get those three right, you turn guests into regulars and friends. Boston is a working-class city. They appreciate servers and bartenders. If you get it right, then they are generous with their time, and luckily their tips, sometimes. What’s the most overdone trend right now? People who hate on craft beer! Everyone eats toast, and some guy puts peanut butter and jelly on it. Imagine if he were ridiculed? We wouldn’t get to the steak and cheese! What are you reading? Scripts. I work at the Improv Asylum. My cast is putting up a new show right now. I keep trying to read “Papillon.” I keep getting distracted. My father gave me the book years ago. How’s your commute? I live in Dorchester. I take my bike in. If I’m cooking, I can get there in 19 minutes. I try to beat my personal best. Or I take the red line. What’s the one food you never want to eat again? I’m not a squeamish eater. I’m not intimidated by food. But I was at a pig roast gone wrong once. I don’t want to put gross details in, but this was city kids trying to roast a pig. It barely got cooked. The ears were good, like crispy bacon. What kind of restaurant is Boston missing right now? Any time I’ve been to South America, they have the best Hawaiian pizza. Something about the dough! Cuba, Colombia, I don’t know how they do it. It’s so sweet. I’ve never been able to find that in Boston. What’s your most missed Boston restaurant? Me and my brother used to go to Daisy Buchanan’s on Newbury. You can get Keno on Newbury? That was a big deal. Who was your most memorable customer? I got a story for you. I was working at Mr. Dooley’s behind the bar. I was a bar back at the time. A regular said, ‘What are those?’ She pointed to a ring of keys hooked on the neck of a bottle. Just as a wisecrack, I said, ‘A janitor used to come here and drink all the time. Those were his keys.’ I must have gone to change a keg. I came back and I noticed this woman with five or six people around her. She says, ‘And that was the vodka the janitor drank!’ People were in awe! To this day, I can’t stop laughing. If you had to eat your last meal in Boston, what would it be? The meal I told you earlier: Mama Mei’s dirty fried rice, fried chicken wings, some ice cream — and a martini with cold gin.